The “strat sound” is an essential blues texture, and even more so when it comes to Jump and West Coast Blues styles. Players like Duke Robillard, Ronnie Earl, Anson Funderburgh, Jimmie Vaughn and Little Charlie Baty play lines that accentuate the Strat’s unique tonal characteristics. 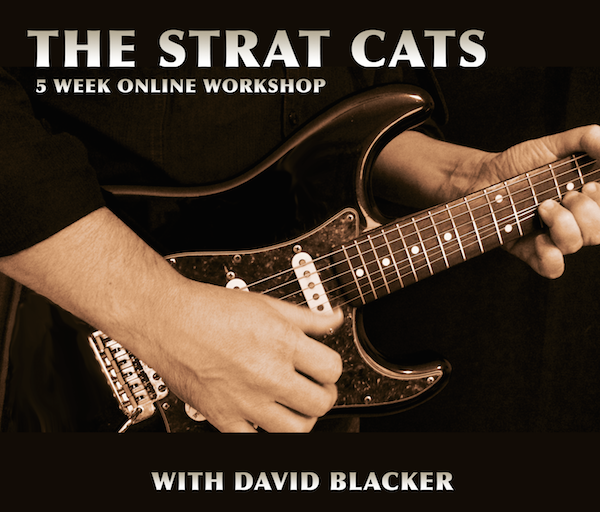 This package includes 6 lesson segments, each containing 1 twelve bar solo featuring key strat cat licks and phrases. Each of the 6 individual segments contain a performance video, an explanatory video (breaking down the performance), tablature and a jam track. The Workshop is in video exchange format, which means each week you can submit a video performance and I will provide video custom feedback on that lesson segment. The course is notated using “Soundslice” which provides mobile ready tab, with playback speed controls and synched to the actual video content. Your satisfaction is my highest concern. If for any reason you are not satisfied with the workshop I’ll provide a 100% refund within 7 days of the purchase date. Excellent lessons! I had a great time learning them and putting them together! After the mini workshop I continued with some of the single lessons. David’s feedback was always fast, giving comments and suggestions. He even took some extra time to come up with variations of the licks for me to work on! His knowledge and enthusiasm for this style are large. He gave me a long list of recording to listen to! If you want to learn more or discover this style of music this is the place to go!